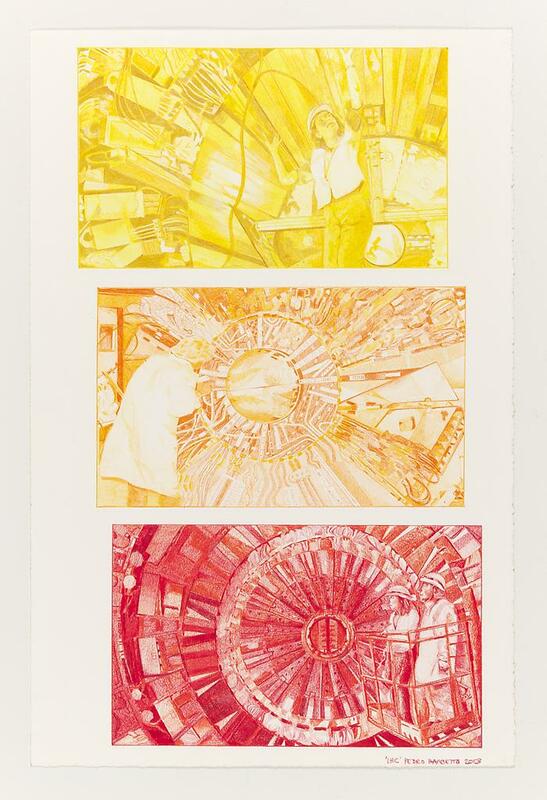 The God Particle (LHC Black, LHC Red, LHC Yellow, LHC Blue), 2013. Wall painting, acrylic pigment printout & 3D printout on 3 canvases, 9 1/2 x 35 ft.
LHC Red, 2013. Acrylic, pigment printout and 3D print out on canvas, 50 x 72 x 4.5 in. 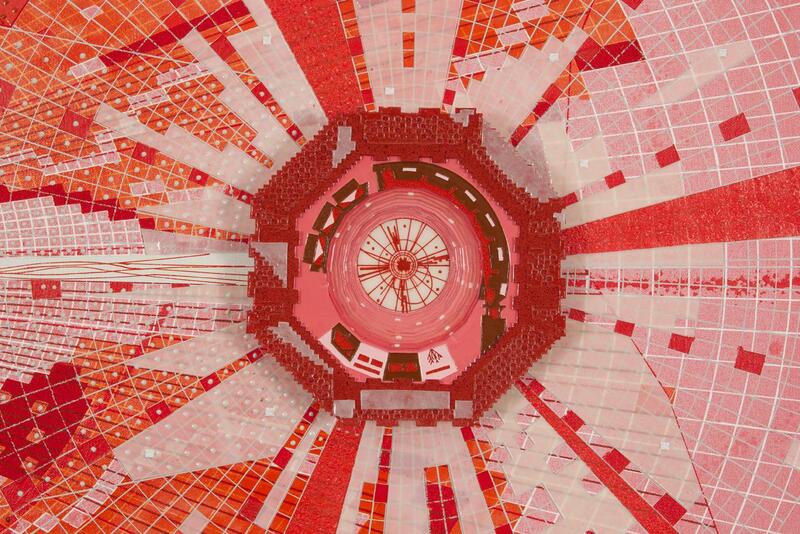 LHC Red(detail), 2013. Acrylic, pigment printout and 3D print out on canvas, 50 x 72 x 4.5 in. 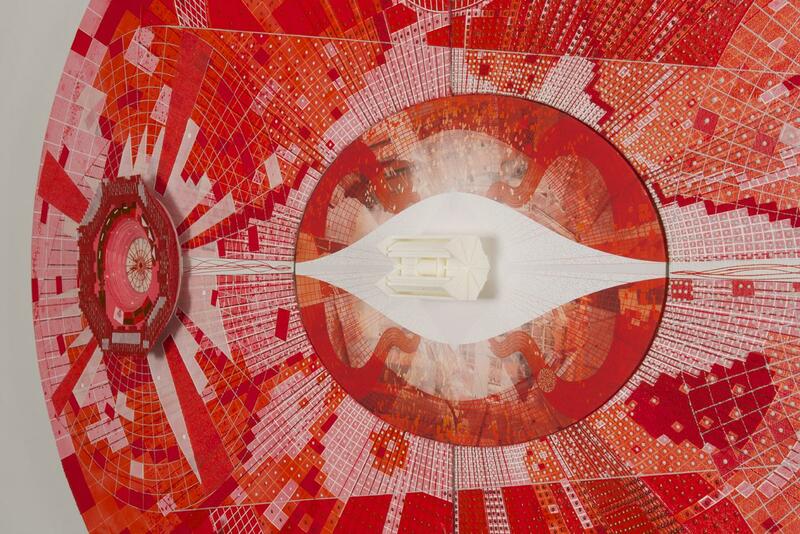 LHC Red (detail), 2013. Acrylic, pigment printout and 3D print out on canvas, 50 x 72 x 4.5 in. 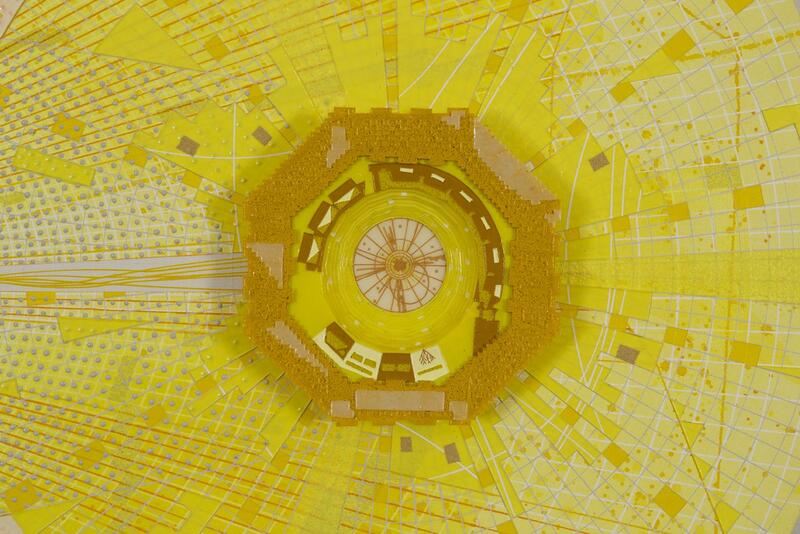 LHC Yellow, 2013. Acrylic, pigment printout and 3D print out on canvas, 50 x 72 x 4.5 in. 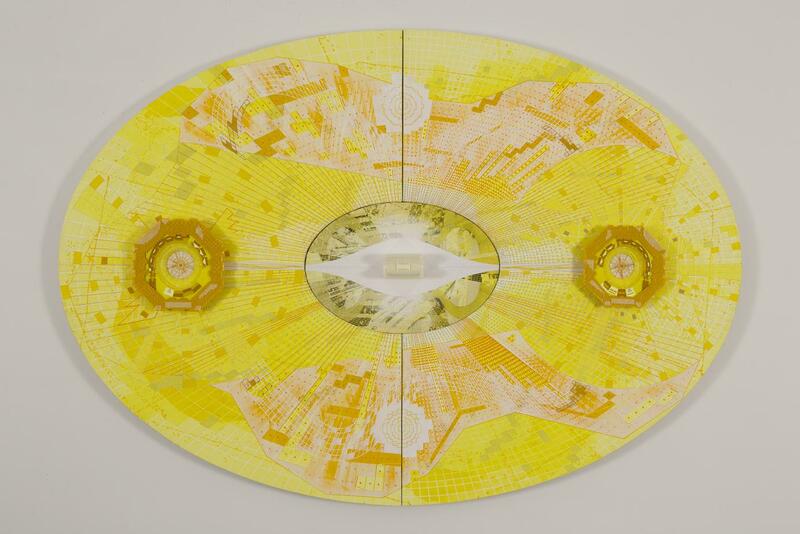 LHC Yellow (detail), 2013. Acrylic, pigment printout and 3D print out on canvas, 50 x 72 x 4.5 in. LHC Blue, 2013. Acrylic, pigment print out on canvas, 50 x 72 x 4.5 in. 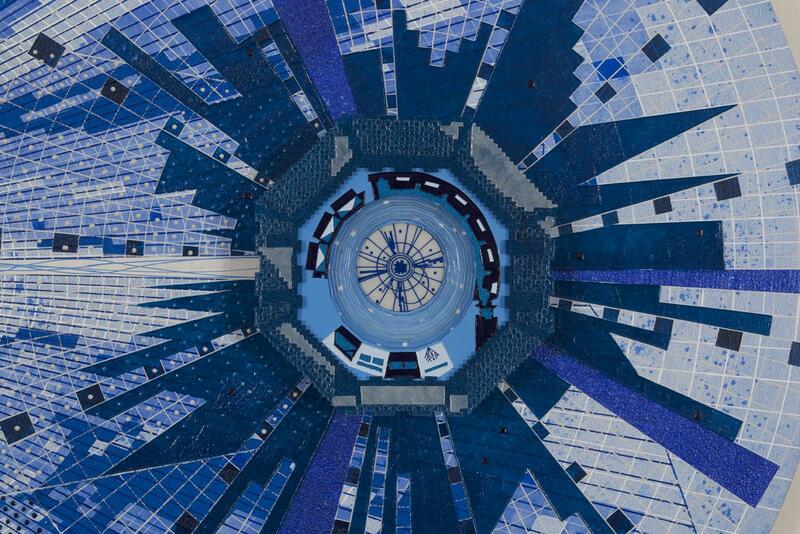 LHC Blue (detail), 2013. Acrylic, pigment print out on canvas, 50 x 72 x 4.5 in. 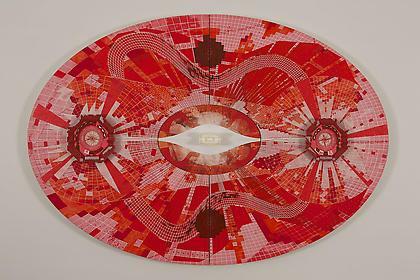 James Webb 1, 2012. Acrylic and pigment printout on canvas, 50 x 72 x 3 in. 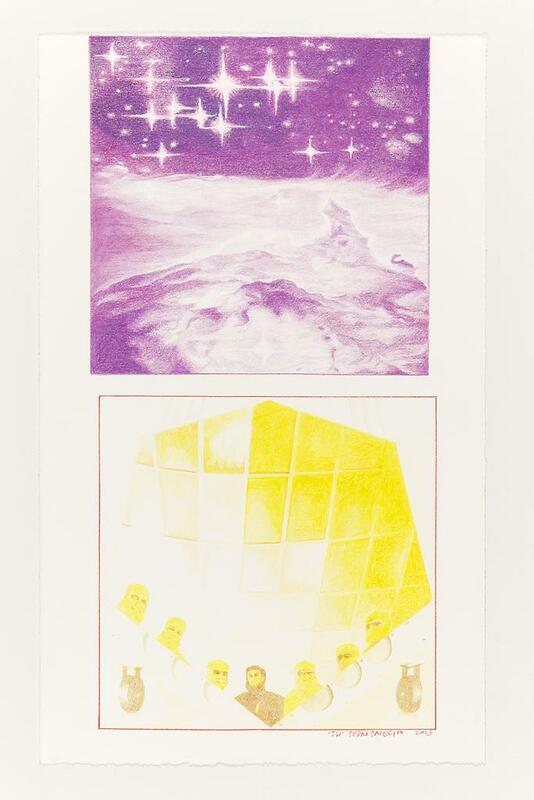 James Webb 1 (detail), 2012. Acrylic and pigment printout on canvas, 50 x 72 x 3 in. 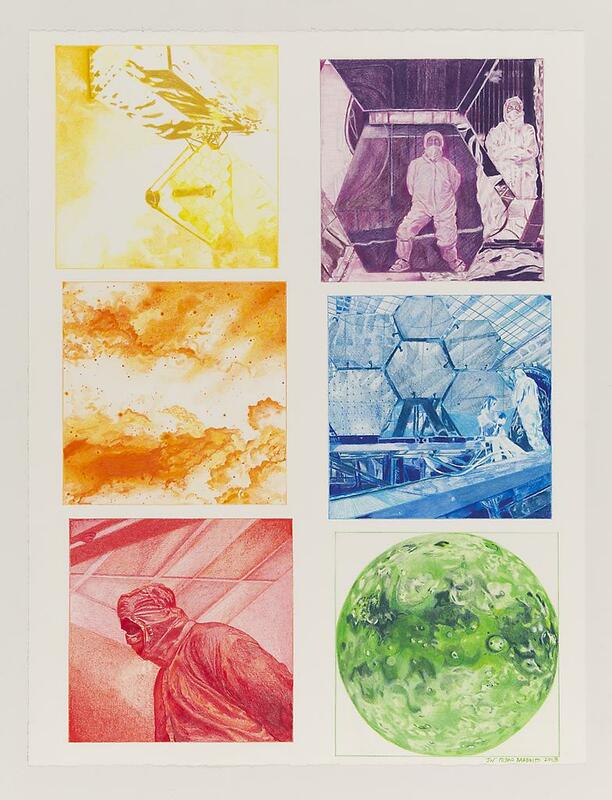 James Webb II, 2013. Acrylic and pigment print out on canvas, 50 x 72 x 3 in. James Web II (detail), 2013. Acrylic and pigment print out on canvas, 50 x 72 x 3 in. Alcubierre Drive D6, 2013. Color pencil on paper, 26.25 x 20 in. 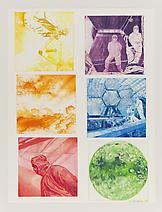 James Webb D6, 2013. Color pencil on paper, 26.25 x 20 in. LHC D6, 2013. Color pencil on paper, 26.25 x 20 in. LHC D3, 2013. Color pencil on paper, 20 x 13 in. 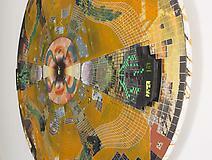 James Webb D2, 2013. Color pencil on paper, 17.25 x 10.5 in. 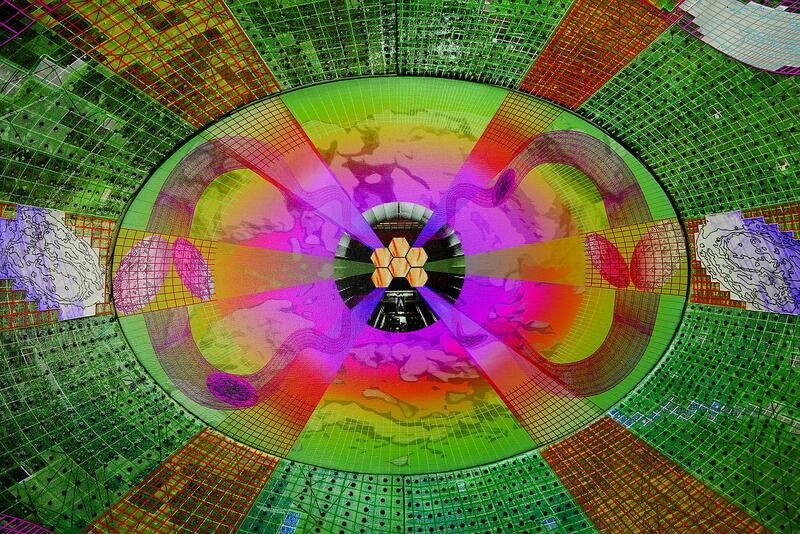 LHC Unified Field Theory, 2013. Colored pencil on paper, 26 1/4 x 40 in. 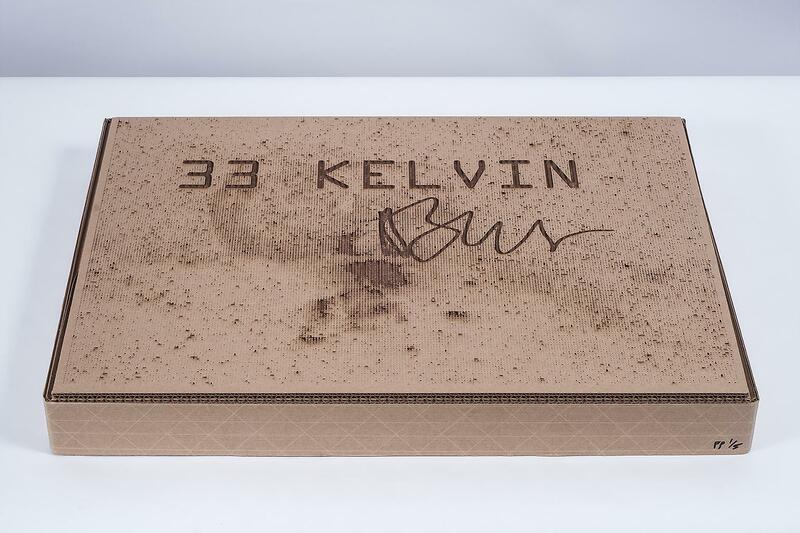 33 Kelvin (box detail), 2013. Edition of 15 and 5 printer's proofs. Screen print, laser etching, woodcut, 3D printout, laser cut and hand assembled box, print dimensions 16 x 38 x 1 in., box dimensions 18 x 24 x 3 in. 33 Kelvin (box open detail), 2013. Edition of 15 and 5 printer's proofs. Screen print, laser etching, woodcut, 3D printout, laser cut and hand assembled box, print dimensions 16 x 38 x 1 in., box dimensions 18 x 24 x 3 in. 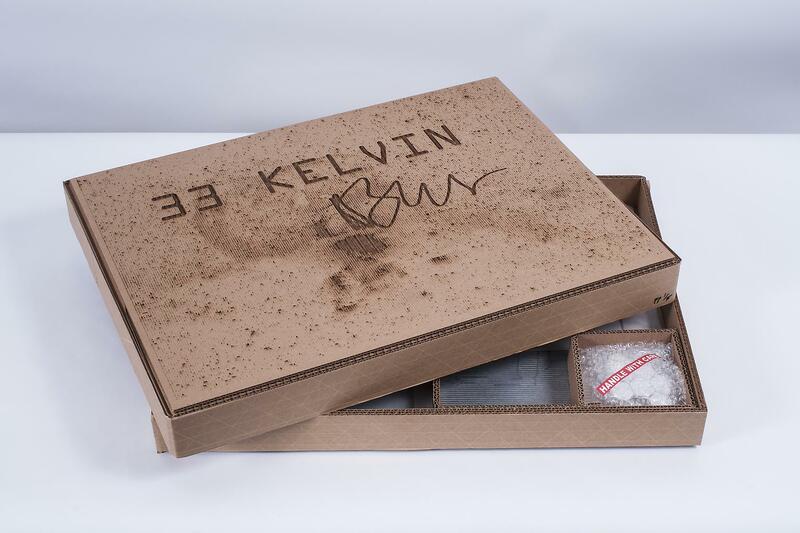 33 Kelvin (inside box detail), 2013. Edition of 15 and 5 printer's proofs. Screen print, laser etching, woodcut, 3D printout, laser cut and hand assembled box, print dimensions 16 x 38 x 1 in., box dimensions 18 x 24 x 3 in. 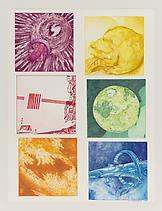 33 Kelvin (print overview), 2013. Edition of 15 and 5 printer's proofs. Screen print, laser etching, woodcut, 3D printout, laser cut and hand assembled box, print dimensions 16 x 38 x 1 in., box dimensions 18 x 24 x 3 in. 33 Kelvin (print detail left side), 2013. Edition of 15 and 5 printer's proofs. Screen print, laser etching, woodcut, 3D printout, laser cut and hand assembled box, print dimensions 16 x 38 x 1 in., box dimensions 18 x 24 x 3 in. 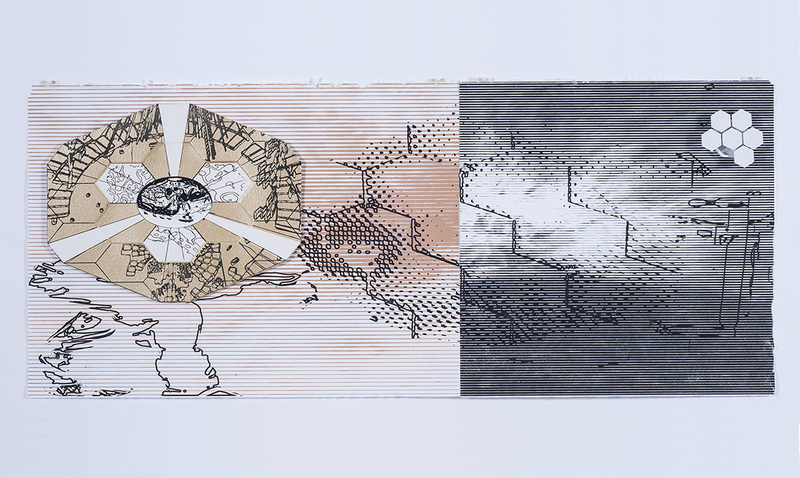 33 Kelvin (print detail right side), 2013. Edition of 15 and 5 printer's proofs. 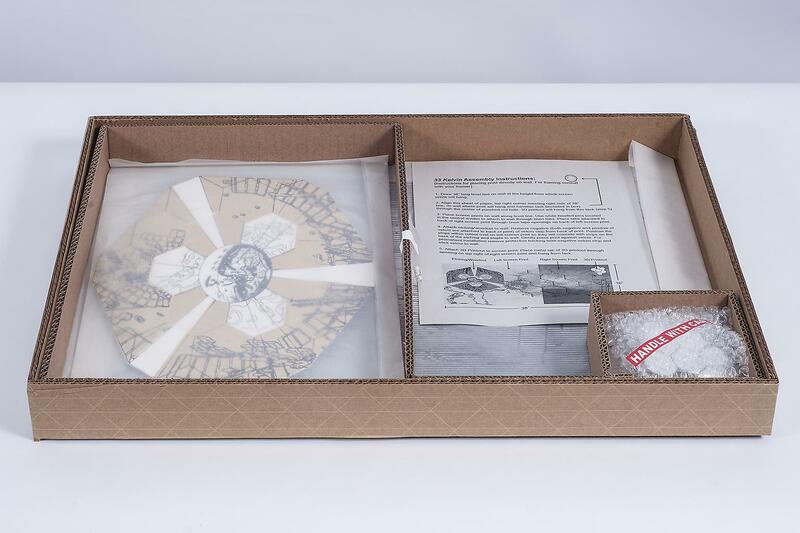 Screen print, laser etching, woodcut, 3D printout, laser cut and hand assembled box, print dimensions 16 x 38 x 1 in., box dimensions 18 x 24 x 3 in. 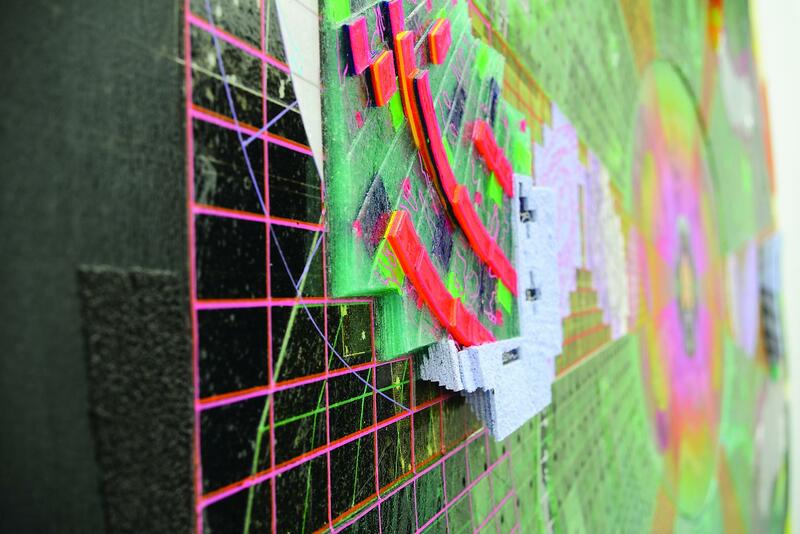 Study for LHC Black, 2013. Edition of 2. Ink on paper, 6 1/2 x 19 3/4 in. Timelapse of Pedro Barbeito creating "The God Particle" from 101 Exhibit on Vimeo. 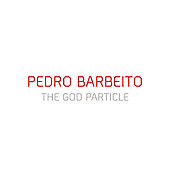 101/EXHIBIT proudly presents The God Particle, a solo exhibition from Spanish-American artist Pedro Barbeito. This is the artist’s first solo showing with the gallery and will include new paintings, drawings, a print edition and a wall installation. The exhibition will be accompanied by a full-color thirty-two page catalogue that will feature an essay written by Richard Panek, the prize-winning author of The Four Percent Universe and the recipient of a Guggenheim Fellowship in Science Writing. The opening reception with the artist will be held on Saturday, December 14, from 7 – 10pm, and is precluded by an artist talk with Barbeito at 6pm. Please RSVP at emily@101exhibit.com to attend this exciting discourse on his new work. The exhibition will conclude on February 8th. 101/EXHIBIT is located in West Hollywood at 8920 Melrose Ave on the corner of North Almont Drive, one block east of Santa Monica Blvd. – RICHARD PANEK, "THE GOOD PARTICLE," CATALOGUE ESSAY, 2013. LHC Red 2013. 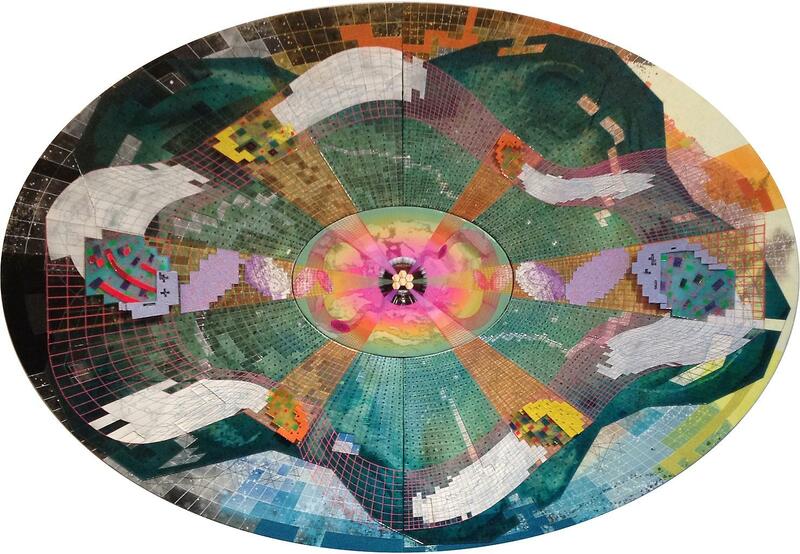 Acrylic, pigment printout and 3D printout on canvas, 50 x 72 x 4.5 in. 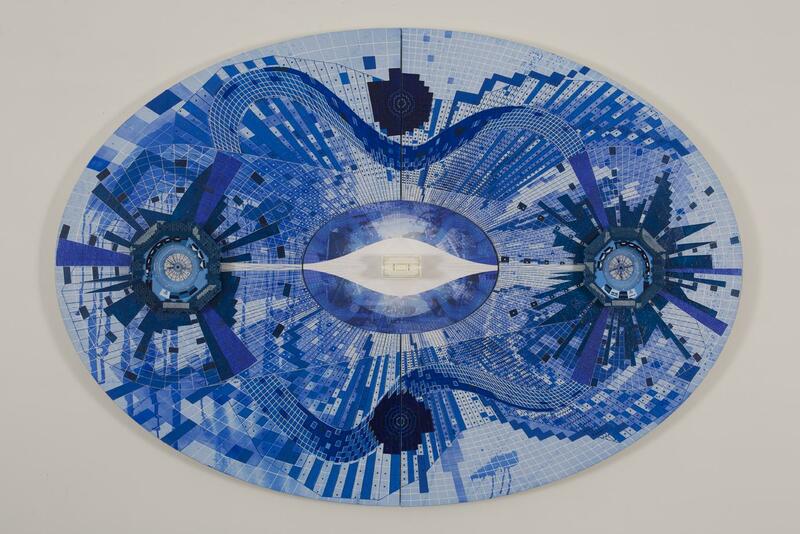 New York-based artist Pedro Barbeito at 101/EXHIBIT presents a new body of work that revisits his Science and Technology series. Barbeito last focused on this series from 1996 to 2001. Just as the millennium was inherently a contextually saturated time for the artist, this day-in-age yet again presents an irresistible opportunity to explore a scientific milestone in mankind’s existence. 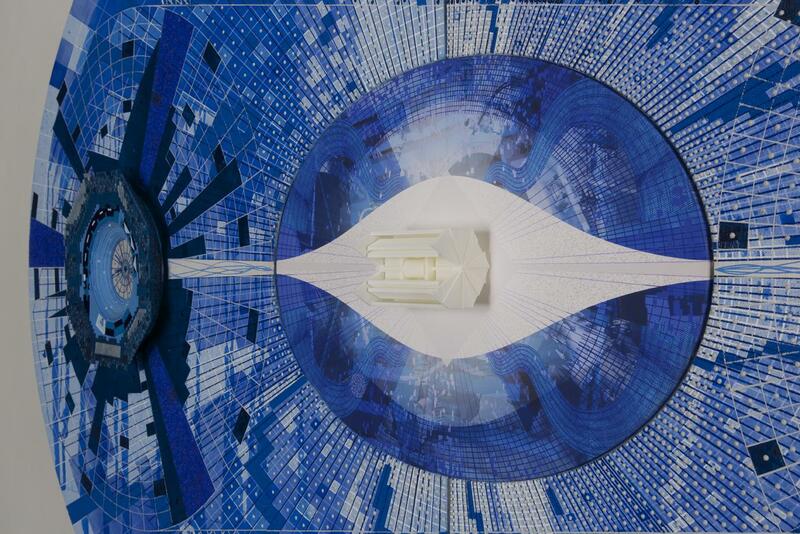 This is the discovery of the Higgs Boson in the collision chamber of the Large Hadron Collider (herein abbreviated as LHC) at CERN in Geneva, Switzerland. This discovery arrives as a precursory revelation on a micro level to the launch of the James Webb Space Telescope in 2018 that will provide further understanding from a macro perspective. This dual approach to further investigating and comprehending the universe, either at the particle level or from extreme distance (the JWSP will serve as the Hubble telescope’s heir), is the platform upon which Barbeito bases this new body of work. 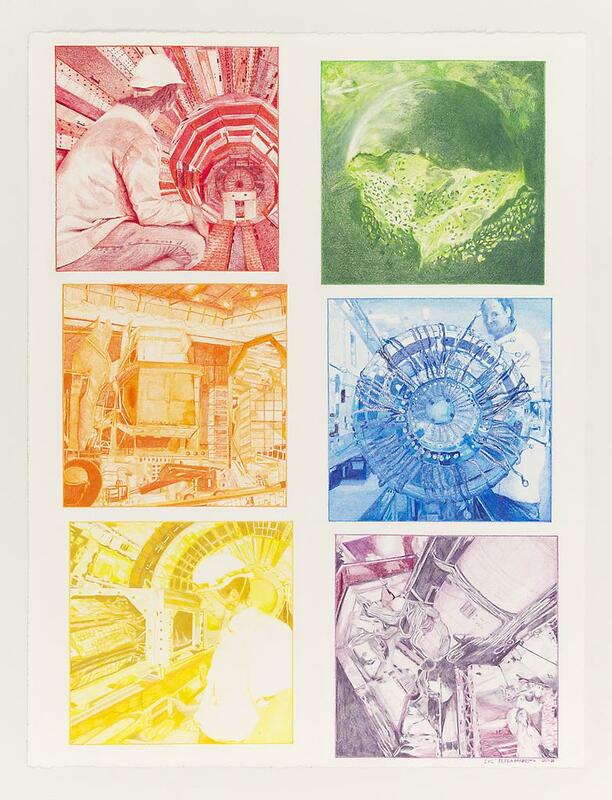 These polarities serve as the terminals that differentiate yet unite the paintings, drawings, and prints into a cohesive artistic analysis of our most current and important developments in the fields of particle physics and cosmology. 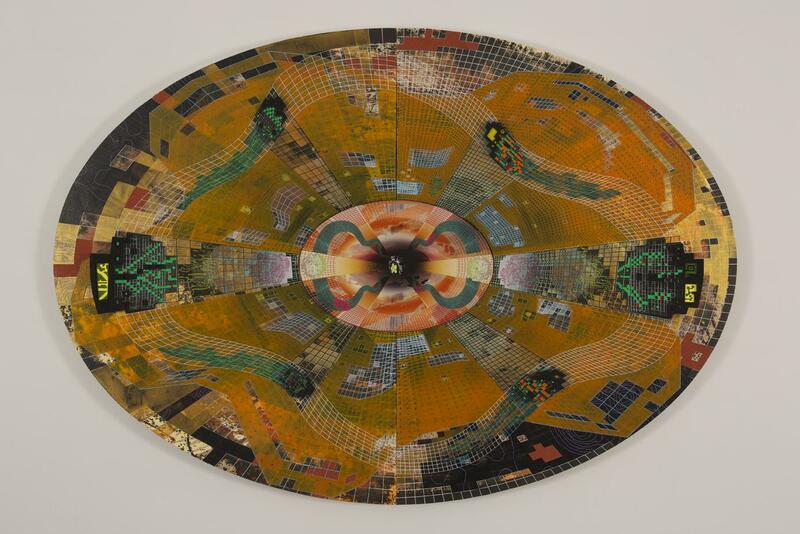 Consider, for instance, the exhibition’s grand installation of three of Barbeito’s signature ovular paintings on canvas, LHC Red, LHC Yellow, and LHC Blue hung in situ within the composition of LHC Black. 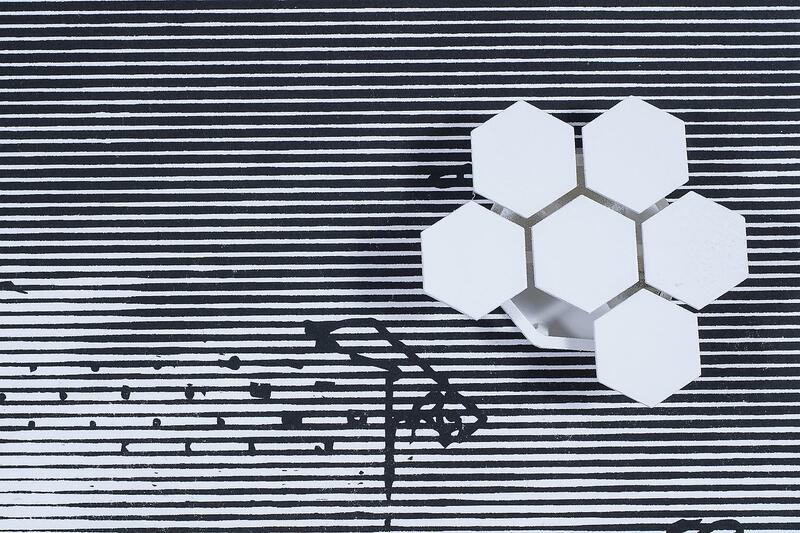 Executed using the foremost developments in acrylic gel mediums and 3D printing—a metaphor for the synthetically dependent world in which we exist—this installation mimes being present in the chamber post-collision. 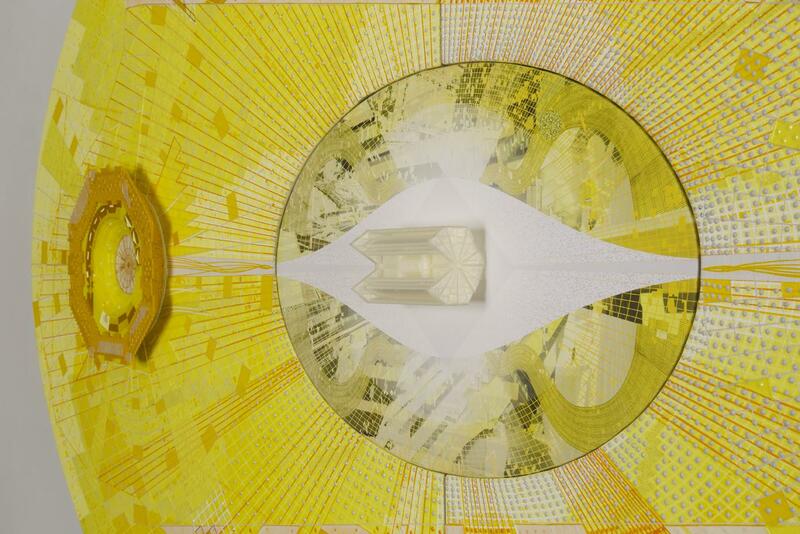 The viewer can experience, through “traditional” painting practice, a representation of a virtually unperceivable landmark in particle physics occurring at the micro level. Posing an important question in respect to contemporary realism, are Barbeito’s “representations” valid? By delving into the paradox of realism via the use of linear one-point perspective to derive micro/macro observational representations of the universe, there is the credible sense that the artist creates palpable and computational realizations of space, time, and matter. 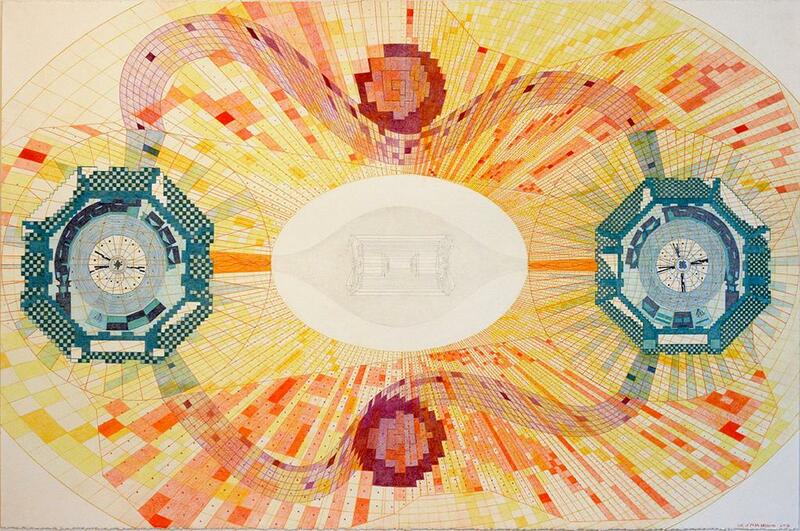 Though technology is used throughout, these works remain inevitably anthropomorphous in that the causal sequences and mathematical formulas fundamental to our understanding of cosmology and particle physics already presumes the human touch. The works are then indeed, in a true sense, literal facsimiles—albeit abstract feeling ones upon initial inspection—of actual moments in our scientific history. Barbeito was born in 1969 in La Coruña, Spain. He lives and works in Brooklyn, New York. He received his MFA from the Yale School of Painting and Sculpture in 1996. 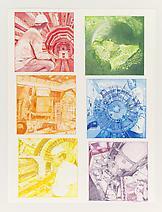 His work examines the intersection of digital imaging, science, technology, and painting history. Barbeito has exhibited his work internationally for the past fourteen years. Solo exhibition venues include Aldrich Contemporary Art Museum in Connecticut, Basilico Fine Arts and Lehmann Maupin Gallery in New York, Parra-Romero Gallery in Madrid, and Galerie Richard in Paris. He has participated in museum exhibits at the Rose Art Museum in Massachusetts; the Museum of Modern Art in Arnhem, The Netherlands; The Palm Beach Institute of Contemporary Art in Florida; and the Museo Rufino Tamayo in Mexico City, among others. 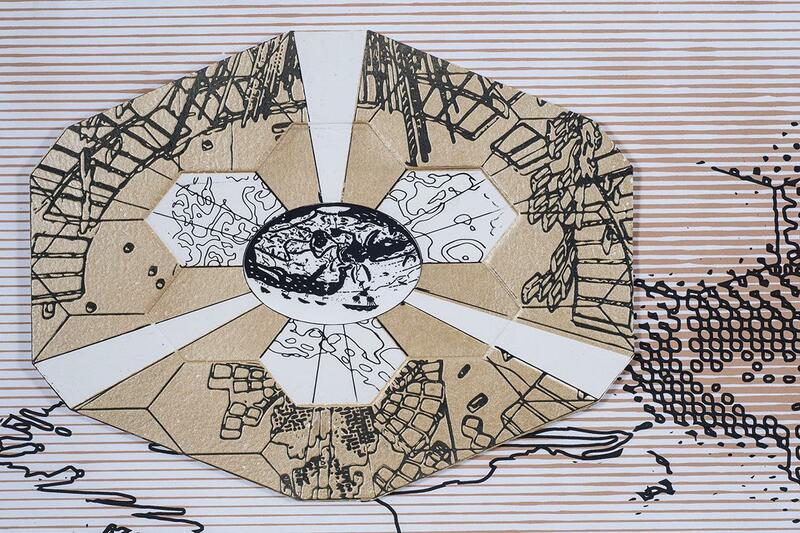 101/EXHIBIT is a contemporary art program dedicated to presenting international emerging and established talent. Spanning multiple mediums, with a particular focus on figurative painting and drawing, the gallery engages its audience with a finely tuned roster of artists in consistent and flourishing states of production in practice. 101/EXHIBIT is unique in its twofold mission to promote the artist and to inspire the collector. 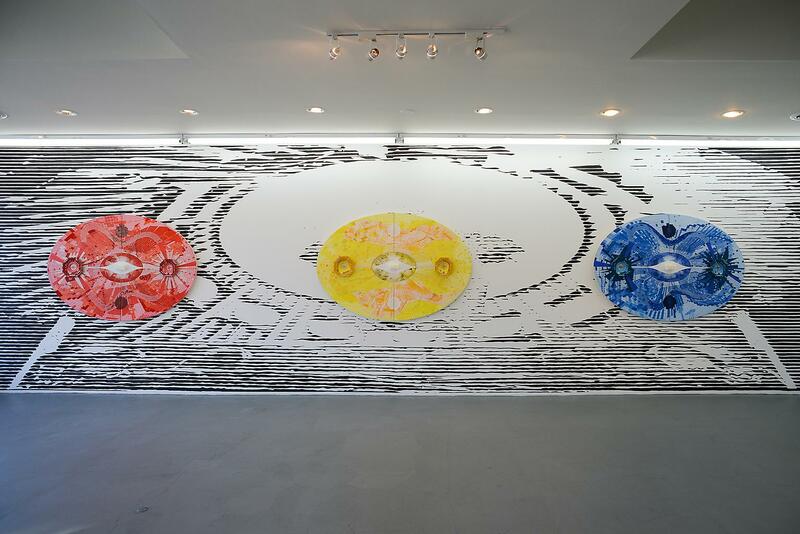 Founded by Sloan Schaffer in 2008, the gallery is situated within the heart of West Hollywood, CA with ancillary spaces in Los Angeles, New York, and Miami.